Now that the Taliban has been removed from Medal of Honor, the U.S. Army may be reconsidering its decision to ban the game from stores on military bases. 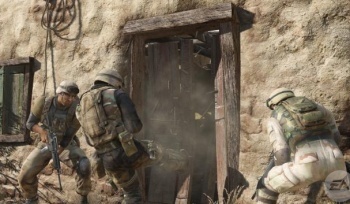 The Army announced in early September that EA's Medal of Honor reboot would not be offered for sale in GameStop stores located on U.S. military bases or through PX stores elsewhere in the world because of the inclusion of the Taliban as a playable online faction. The ban was imposed "out of respect to those we serve," said Army & Air Force Exchange Service Commander Maj. Gen. Bruce Casella, and GameStop, "out of respect for our past and present men and women in uniform," agreed to honor it. But now that EA has removed the Taliban from the game, it appears that the Army might be reconsidering the situation. GameStop declined to comment on the change but an AAFES representative told Joystiq that the Army is "aware of reported changes to the latest Medal of Honor game" and that "the organization has been, and continues to be, engaged in a thorough review to fully understand the extent of the modifications." Furthermore, while EA Vice President of Communications Jeff Brown said the publisher hasn't come right out and asked the military to change its mind, he did send a letter last month "clarifying some facts about Medal of Honor." We all know that the Taliban hasn't actually been removed from the game, it's just been renamed to the Half-Life-esque "Opposing Force." And there's no guarantee that the Army will do about about-face on selling the game in its stores. But the fact that merely changing a team name warrants even a discussion about lifting the ban is troubling. How exactly is it respectful to say that the only way it's appropriate to release a videogame about the ongoing exploits of the U.S. military is to pretend that it's not actually about the ongoing exploits of the U.S. military? Medal of Honor comes out on October 12 for the PC, PlayStation 3 and Xbox 360.